I’m sure they’re good ones, because I have plenty of good excuses, too! And I don’t want you to think I’m being dismissive or unkind about your excuses – our reasons for not writing are generally based on real difficulties, or real fears. So if you’ve used any of the excuses on this list, please don’t feel attacked in any way. All of them are – to some extent – valid. But they can also be overcome. This is probably the number one excuse for not writing – and for most writers, it’s a very understandable one. We lead busy lives: I know writers with full time jobs and long commutes, and writers with several small children to take care of. Even writers who are retired might be volunteering, caring for grandchildren part-time, or looking after an ill or disabled spouse. 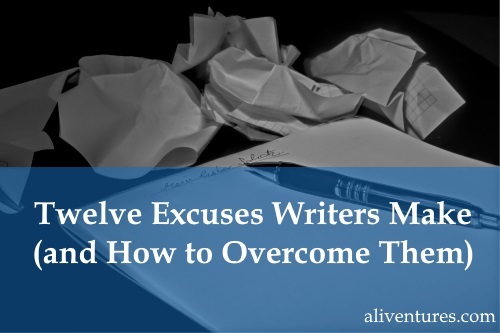 Overcome it: Most of us have some time we could use for writing. It might mean making some hard decisions (like setting aside another hobby for the time being) or it might mean getting other people on board (like asking your spouse, or another family member, to do more of the childcare). It might well mean getting into a consistent writing routine, so that the little time you do have is used well. I hear this a lot, too – not always stated explicitly. I think almost every writer has this fear to some extent: that we’re just not good enough. Even after ten years freelancing and lots of lovely comments from editors, I still worry that I’m somehow lacking! For newer writers, this is an excuse that can lead to taking course after course, reading book after book … and writing very little. Overcome it: However good (or not) you are at writing, the way to improve is to write! Remember, you are absolutely entitled to write because you enjoy it – you don’t have to reach a magical level of skill in order to be “allowed” to spend your time writing. Take the plunge and share your work with others, too: maybe a local writing group or a writer friend. Ask them to share what they liked or what was working well in your piece – this can be a wonderful confidence boost! This crops up for some writers: maybe they left school at 16, or they think that writers need a university degree or a special qualification. (Spoiler alert: it really doesn’t!) Of course, good writing does require a grasp of fundamentals like sentence structure and grammar … but if you’re a keen reader (and most writers are! ), you’ve almost certainly picked these up over the years without any formal education about them. Overcome it: I’m in the lucky position of having quite a writerly educational background: I studied English at Cambridge University, and took a Masters degree in Creative & Life Writing at Goldsmiths College (part of the University of London). While the Masters was certainly helpful, the key benefit from that was having feedback from my peers and my tutors on my work-in-progress – something you could easily replicate with a local writing group (free/cheap) and mentoring/coaching (potentially quite costly, but far cheaper than a Masters degree). In terms of my freelancing, all my clients care about is how well I write – most of them don’t even know about my degrees! This is an excuse I do understand, because I started writing – with fairly serious intent – when I was fourteen. I still have the novel I wrote (in a notebook with a frog on the cover) back then. If you’re under 18, and particularly if you’re under 16, there is some validity to this excuse: you may well be ineligible for most writing competitions, for instance. Overcome it: Being young is no reason not to write! Some young writers are exceptionally talented – even if you aren’t (I wasn’t! ), by starting young, you’ll have got in some invaluable practice before you hit your 20s. Look for local writing groups or classes – many will welcome you (I joined one at 14, along with my mum, who’s also a writer, and they were lovely and a huge part of my growth as a writer). Now that I’m approaching my mid-30s (yikes), I’m starting to understand this excuse a little more. I realise that, in the grand scheme of things, I’m still relatively young! But I’ve also seen plenty of writers become very successful in their 20s and it’s hard not to feel a little twinge of envy … plus a sense that time is rapidly ticking away. I know that many writers come to writing at a later season of their life – often after their children are grown, or once they retire – and I know age can feel like a real difficulty then. Overcome it: While the media often focuses on young talent, there are plenty of writers who started their careers later in life. There’s a good list here. However old you are, it’s never too late. Editors (and readers) won’t care about your age – just about the quality of your writing. Overcome it: Find writers who can support you – maybe through an online group, if you can’t easily get to a local writers’ group. With family members, be direct about what you need (e.g. 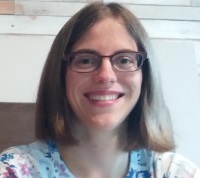 “could you take the kids on Saturday mornings till 9am so I can get up early and write for a couple of hours?”) For some great suggestions for a particular writer who had difficulties getting her family to respect her writing time, check out this post on the Captain Awkward blog. Well … this isn’t an excuse so much as a reason why you’re not seeing as much success as you’d like to! In the early stages of my writing career, I told myself that I was just the sort of person who “starts things and doesn’t finish them”. Years on, I can see that most of us are like that to some degree – it’s normal for initial enthusiasm about a project to wane, and it’s normal to try things that don’t quite pan out. Overcome it: Finish something! With old projects, either decide to complete them to the best of your ability – or let them go completely. Treat them as useful practice. If you want to start something new, make it something small, and don’t start anything else until you’ve finished it. I’ve heard this from quite a lot of writers, both those thinking of aiming for traditional publication and those aiming to self-publish. There really aren’t any writers who “just write” – even if you have a publishing deal, you’ll need to do a lot of marketing work, though you may well have some help from your publisher’s team. Overcome it: The great thing about marketing is there’s no one “right” way to do it. There are lots of activities you could try: writing a free book to give away, blogging to build an audience, writing guest posts for other people’s blogs, paying for advertising through sites like BookBub, or paying for Facebook or Amazon ads. If the options are making your head spin a bit, Joanna Penn’s How to Market a Book is a handy guide to the various possibilities. Many writers (including me) find themselves putting off writing until after some particular event or stage of life is over. “In the new year…” or “Once the kids start school…” or “When I retire…” are all popular ones. Sometimes, life really is too hectic and draining to contemplate writing – but often, waiting until “X” happens can be a bit of an excuse. Overcome it: If you enjoy writing, make it happen! You might have to write in very short bursts (a few years ago now, I wrote about how I was writing fiction in two 15-minute slots each day) – but any writing is better than no writing. Look for ways to fit in some writing, even if that means juggling around a few other things. This can be a difficult excuse to overcome. Perhaps there’s a writer who you really admire – maybe someone whose books you’ve been reading since childhood, or maybe someone who’s a personal friend. 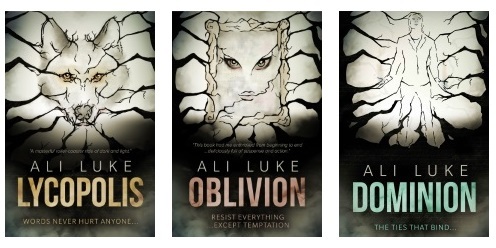 They’re just so good, and you can’t imagine ever writing anything as good as their books. Overcome it: This feeling itself is a sign that they’re on the right path! If you can recognise good writing – and also see that yours doesn’t yet match up to the ideal – then you’re far further along than a new writer who has no idea what makes a piece well written or badly written. Another key thing to remember is that “good” is very much in the eye of the beholder. Perhaps you’ll never have Famous Writer’s vivid imagination, or their clever literary style … but you might be better at crafting plots and writing stories for a mass market. This isn’t always an excuse that writers voice out loud, but it’s often an underlying reason for not writing. (“I couldn’t write a novel, I don’t know how!”) It can go hand-in-hand with worries about a lack of education, or with a sense that “other writers” somehow mysteriously know how to write without ever reading a book or taking a course. Overcome it: If there’s a particular area of writing that you’d like to try … find out how to do it! There are so many beginner-friendly courses, books and blog posts out there that can help. The same goes for any non-writing tasks that you don’t know how to do (like setting up a website for your writing, or self-publishing your novel on Amazon). I want to tread very cautiously with this last excuse, because it has a great deal of validity – and for some writers, it sadly really is a reason for being unable to write. I’m lucky enough to be in robust good health – the closest I’ve come to experiencing any sort of long-term illness is during my pregnancies, where I was flat-out exhausted for the first trimester or so. Overcome it: If you’re too unwell to write, then please don’t pressure yourself to do so. However, if writing would be helpful for you – whether as a diversion, a form of therapy, or simply something you can be glad to have accomplished – then it’s worth looking for ways to do at least a little of it. That might mean lowering your expectations (especially if you used to write before you were unwell), or looking for equipment or software that could make it easier – e.g. a laptop stand so you can type lying down in bed, or dictation software if you can’t comfortably type. We all have excuses for not writing, or not writing as much as we could … at least, I definitely do! The truth is, writing is hard: it can be a lot of work, it can be emotionally draining, and it can be bound up with so many hopes and fears that it’s almost inevitable we find excuses not to do it. I hope today’s post has helped you think about some of your own excuses – and about whether you can overcome them, even in a small way. If you want more help and encouragement, make sure you’re signed up for the Aliventures email newsletter: it’s completely free. You’ll get every blog post straight to your inbox, plus a weekly newsletter on Thursdays with a short article about an aspect of writing. You’ll also get access to a library of mini-ebooks – including Time to Write: How to Fit More Writing Into Your Busy Life, Right Now – to support you with your writing. You’re right. Writing is hard. I think admitting to yourself that you’re making an excuse is the first step to overcoming it. Thanks Cheryl! It IS hard — I think sometimes we have to recognise that, and realise that it’s normal to feel a bit (or a lot!) reluctant to sit down and do it. “I have to wait until I’ve done some more work on my PhD”…. Only I ALWAYS have more work to do! It’s such an easy excuse to make … I think the tough thing is, all these excuses have quite a bit of validity to them! That was a great blog posting. I use 11 out of the excuses regularly, often simultaneously. Like many things in life it’s important to get down to the real roots of the problem and then creating a system, a methodology, or a mind-set to manage the problem and then overcome it. Getting at the roots of the problem can make such a difference — as you say, in so many areas of life. I’m all for systems and routines, too! And thanks for the kind words. I had a whole lot of excuses for not blogging 😉 but it’s great to be back! I can identify with several of the excuses, and I’m currently going through a rough patch where my life really isn’t my own. I need to sit down and make a plan and I need to overcome the things that are stopping me from writing. Sorry to hear about the rough patch, Maria — I hope things get easier for you. And I hope you can fit in a bit of writing even while it’s difficult (during my own tough times, I’ve found that writing even a little bit can really lift my mood and help me feel a bit more in control of everything). That’s pretty much exactly what I did, Rafal, back when I was working full time — I found it much easier to write before work than after! Good on you getting into a routine with it. Actually Writing is Easy, and i love to Illustrate charecters from my novel series, plus I Love Poetry and Song Rewriting. Sasly my spouce is not supportive he said it a waste of time and it is draining our family. he even threatened to smash my tablet and wipe out everything i created, watching my cry in tears over it.. IM TIRED OF THAT DICTATOR IN MY LIFE. don’t give a fudge i love to write. And yes i will keep at it. so far i have over 25 novels in the series planned out. it starts off with a couple whom have difficulty in having a child of their own, however after enduring the painful heartbreak of miscarrages and stillbirths, and nearly coming close to loosing the love of his life in the process, they are expecting a baby, as worrisome, fearful, it is they still have hope, and with this they have their one and only child. It is through this couples only child that their Family tree blooms, grows, and spans out 10 generations..
i love writing it is like a fire in my heart and a strong desire in my soul that keeps telling me to Keep going and never give up. Excuse the slow reply, Laurie! I’m so glad you’re enjoying your writing so much — though terribly sorry to hear about the hostility you’re experiencing from your spouse. It sounds like you have a great imagination and loads to write about (25 novels planned — wow)! I’m guilty of using many of these excuses. And the worst thing is that I use them on myself… Ugh… But this post has some really good suggestions on how to overcome them. Thank you!